Proponents of clean energy will soon have a new source to add to their existing array of solar, wind, and hydropower: osmotic power. Or more specifically, energy generated by a natural phenomenon occurring when fresh water comes into contact with seawater through a membrane. Researchers at EPFL's Laboratory of Nanoscale Biology have developed an osmotic power generation system that delivers never-before-seen yields. Their innovation lies in a three atoms thick membrane used to separate the two fluids. The results of their research have been published in Nature. The concept is fairly simple. A semipermeable membrane separates two fluids with different salt concentrations. Salt ions travel through the membrane until the salt concentrations in the two fluids reach equilibrium. That phenomenon is precisely osmosis. If the system is used with seawater and fresh water, salt ions in the seawater pass through the membrane into the fresh water until both fluids have the same salt concentration. And since an ion is simply an atom with an electrical charge, the movement of the salt ions can be harnessed to generate electricity. EPFL's system consists of two liquid-filled compartments separated by a thin membrane made of molybdenum disulfide. The membrane has a tiny hole, or nanopore, through which seawater ions pass into the fresh water until the two fluids' salt concentrations are equal. As the ions pass through the nanopore, their electrons are transferred to an electrode - which is what is used to generate an electric current. Thanks to its properties the membrane allows positively-charged ions to pass through, while pushing away most of the negatively-charged ones. That creates voltage between the two liquids as one builds up a positive charge and the other a negative charge. This voltage is what causes the current generated by the transfer of ions to flow. "We had to first fabricate and then investigate the optimal size of the nanopore. If it's too big, negative ions can pass through and the resulting voltage would be too low. If it's too small, not enough ions can pass through and the current would be too weak," said Jiandong Feng, lead author of the research. The potential of the new system is huge. According to their calculations, a 1m² membrane with 30% of its surface covered by nanopores should be able to produce 1MW of electricity - or enough to power 50,000 standard energy-saving light bulbs. 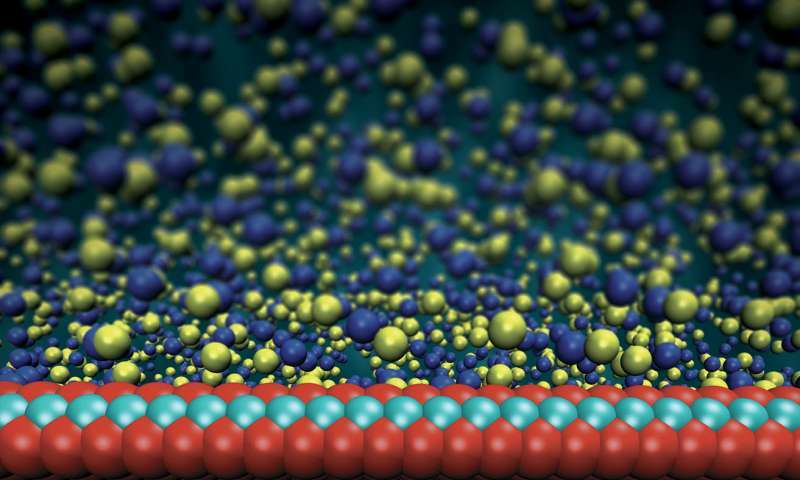 And since molybdenum disulfide (MoS2) is easily found in nature or can be grown by chemical vapor deposition, the system could feasibly be ramped up for large-scale power generation. The major challenge in scaling-up this process is finding out how to make relatively uniform pores. Until now, researchers have worked on a membrane with a single nanopore, in order to understand precisely what was going on. '' From an engineering perspective, single nanopore system is ideal to further our fundamental understanding of membrane-based processes and provide useful information for industry-level commercialization'', said Jiandong Feng. EPFL's research is part of a growing trend. For the past several years, scientists around the world have been developing systems that leverage osmotic power to create electricity. Pilot projects have sprung up in places such as Norway, the Netherlands, Japan, and the United States to generate energy at estuaries, where rivers flow into the sea. For now, the membranes used in most systems are organic and fragile, and deliver low yields. Some systems use the movement of water, rather than ions, to power turbines that in turn produce electricity. Once the systems become more robust, osmotic power could play a major role in the generation of renewable energy. While solar panels require adequate sunlight and wind turbines adequate wind, osmotic energy can be produced just about any time of day or night - provided there's an estuary nearby. Is there a shorter route to this? That is Awesome! Although I do imagine that producing electricity by making freshwater salty, would only be useful in places with ample freshwater to support the process. It is interesting though, that electricity can be produced simply through osmosis. Great Stuff! You'd think it was being worked on as we speak. This sounds awesome. A megawatt is certainly enough energy to desalinate enough water to cover one side of a 1 sq meter membrane - if that's the case, and this thing is located ocean-side, then it can produce an endless supply of fresh water and has an endless supply of salt water too (in fact, this can easily be a closed loop where water is recycled and purified). Anyway, that's free energy and it violates something about entropy laws - the usual, actually, for this type of announcement. Far too good to be true - this is more power per unit mass than Thorium. As a matter of fact, nothing is consumed at all. A bag of salt, a bucket of water, and some molybdenum disulfide plus a little engineering and this thing could operate in deep space forever. How did this get printed? That is Awesome! Although I do imagine that producing electricity by making freshwater salty, would only be useful in places with ample freshwater to support the process. Yes, for example where rivers go into the sea. I don't see any free energy here. You are doing all sorts of work in extracting ions that nature already provided. There is nothing free about that and nothing is being violated. I'm not exactly a chemist. Can someone tell me where the "free" energy is coming from? Or more exactly where is it missing after the process? Can there be some long-term implications for nature? Because it have to come from somewhere. I would not be happy, if it damaged oceans in the long term. No free energy. just ion transfer. That's why I wrote "free". But ion loses it's energy and its charge is affected. Can this mean something on a larger scale and/or after repeated process? Does it renew it's charge or is it permanent? Can it be depleted (neutralized) and will that affect the environment? What's actually happening here is that the solute (the salt ions) is driven through the membrane by osmotic pressure (because the volume of the solvent (water) on the side with the higher salt concentration cannot change, and the solvent moves from the fresh to the salt side, and the osmotic pressure on the salt side can therefore only be reduced by migration of the solute through the membrane to equalize the pressure). Osmosis is generally demonstrated in terms of the movement of the solvent, but if that is not possible then the solute will attempt to move. The membrane is designed with holes of the right size to permit this, and the electrons from the salt ions are left on the salty side, while the ions move to the fresh side; thus, we have a potential difference between the side with extra electrons and the side with extra ions (and therefore extra holes). By allowing a current to equalize the potential difference, power is generated. No, this is not bullsh*t.
As far as it damaging the oceans, if it were going to damage the oceans it would do so far more by merely allowing the rivers to flow unchecked into them. We're merely slowing down the mixing and extracting energy from it; after that's done the waste product is merely salt water. Which is what the oceans are made of already. Hey I have an idea, why don't we use the power generated from this to desalinate sea water ? I think something is wrong with the numbers here. It says one megawatt per sq meter. That's a LOT! Had the same thought. I wouldn't be surprised if it turns out the writer of this pop-sci article confused MW and mW. Since this power is generated by mixing salt and fresh water it would be VASTLY more efficient to just take the fresh water out at that point and pipe it where needed. Can there be some long-term implications for nature? Not really. The water still mixes eventually. All you're doing is slowing down the mixing of fresh and salt water. I.e. you're changing the gradient at a river delta a tiny bit. Since this can't really be used accross an entire delta (because: shipping) that effect would be rather small. Rain water would work. A funnel linked to a tube made of this material, submerged in the ocean, could produce power. As the salinity increases in the tube, so does density, causing the salt water to sink in the tube and be released into the ocean out of the bottom of the tube. I also think this must be mW (milliWatt) per m2 instead of MW (MegaWatt). Just considering that one system with salt water, fresh water and membrane will be one electrochemical cell, producing low voltage probably under 1 Volt, one must connect a lot of these in series, like in solar panels, where silicon solar cell gives a maximum of 0.7 Volts per cell. For tropics this capture of rain water and use of it for generation of electrity with controlled release to ocean might not be a bad idea, provided that it is cheaper than other renewables. And with rain water there is bigger salt concentration difference than at estuaries. This is an interesting discovery but I'm not sure the problems with a production system have been adequately considered - at least in the article. A 1m x 1m of something 3 atoms thick is not feasible mechanically. A 1mm x 1mm device is not feasible either. So there's no comment about how a device might be manufactured with any geometry that is strong enough while retaining adequate surface area that can be exposed to fluids on either side. How would such a device report that it's pores are clogged or that the 3 atoms thick barrier has torn. Production systems engineering is more than just basic science though . I also think this must be mW (milliWatt) per m2 instead of MW (MegaWatt). If it's a mistake, it's not a mistake of this site's author. It's also MW in the university's own news article. Says 50,000 low-power light bulbs- divide a megawatt by 50,000 and you get 20W. That's about right for screw-in fluorescent bulbs. Bottom of the page under "contacts." Let us know what you find out. It does seem something is very wrong with the power density. Obtaining 1 Mega Watt from a membrane 1 meter square - is the equivalent of a very large wind turbine. Here is the synopsis of the original article - http://www.nature...593.html Showing less than Kwh per Meter^2 at around 90% efficiency. Still a lot of power - and articles use Kwh - vs Watts - which makes it hard to compare. kWh are J, not W. And that article specifies the energy (not power) per m³ of water (not m² of membrane). We're looking at P = E/t, so 0.75 kWh/m³ implies a flow rate of 1,000,000/750 = 1,333m³/h = 0.37 m³/s. That's about 370 liters/second, or about 100 gallons/second, through a 1 m² membrane. I doubt anyone's going to make a square meter membrane; for process reasons I expect more like a 1 cm² membrane, and there are 10,000 of those in a square meter, so that's around 37 ml/s. That doesn't seem like a very high rate for a square centimeter of membrane. 37 ml is 2 1/3 tablespoons per second. This sounds reasonable. I'm thinking of a power plant about the size of a standard one, sited on an estuary where fresh and salt water are immediately available, generating a few hundred MW. Waste product is salt water. No heat, since it directly generates electricity. Somebody who wants to figure out the horsepower of the pumps for the water sources could figure out the efficiency. Oh, and you'd filter the water to avoid clogging the membranes. This is obvious. Moving right along, it wouldn't interfere with shipping. You've got three pipes: two inlets and an outlet. No big deal. There're a lot of estuaries around. Like, really a lot. Theoretically. Practically the efficiency of a rainwater system would be very ineffective. It's like making a powerpülant tht harvests lightning strikes: Sure the power in each rain squall/lightning strike is there...but they are far too infrequent in any one location to give you appreciable *average* energy output over time. ...unless you have a huge collection area like, oh, a lake. But in that case you have a river that runs from lake to sea and that IS effectively your rainwater/runoff system (as described in the article). Point was: If you use out/in pipes then you're not using 100% of the river. If you want to get 100% of the river through pipes then your shipping will have to go through the pipes (and membranes! ), too. No, that doesn't sound like a very good idea. There's fish and stuff. The idea is to do it without making a mess. Nor is it necessary; we're getting a megawatt out of 370 cubic meters per second; that's microscopic compared to the flow rate of even a moderate river. This is scalable; you don't build one big plant, you build a lot of small ones. Thanks Da Schneib - you are correct. It would be fascinating to see a working prototype. You have to have two bodies of water - separated by the membrane. Anode dipped in one side, and cathode in the other. As the water flows past the membrane - a current is generated. Numerous variables - the flow rate, the dimensions of the pipes, the strength of the solution. I don't think it would work like that. More like, you'd take "spent" water from near the membrane, and pump fresh water and salt water into the two sides far from the membrane at the same rate. And you'd have a bunch of small cells, not one huge tank. But I'm no process engineer; and it depends on the details. Drop a hydrophilic tube in a glass of water, shine light, and you have a battery. Thanks for the mail and for your questions. As a standard in this nanofluidic field: the density estimation is done via dividing the obtained power by the cross-section pore area and it has been widely used with single pore systems. For example, 4k W/m2 obtained in the nanotube Nature 2013 paper (ref 5), 7.7 W/m2 obtained in the single channel work ref 22. On a large scale (let's assume the individual pore performance doesn't change), it is convenient to fabricate porous membranes with porosity (25% to 95%, defined as ratio of the total pore volume to the apparent volume ) using electrochemical etching technique, eg in porous silicon. Due to similar fabrication mechanism, we could further assume single layer MoS2 membrane with homogeneous pore size of 10 nm and porosity of 30%, resulting in a pore density of 4x10^15/m2. By exploiting parallelization with such nanoporous membranes, the estimated power density would be 10^6 W/m2 with the KCl salt gradient (1M KCl/1mM KCl, pH11). magnitude—the results obtained with boron nitride nanotubes. "..Powering 50'000 energy-saving light bulbs with 1m2 membrane..."
Why "energy-saving" light bulbs in particular? Is this to inflate the figures? I suspect that was a comment with rather corrupt motive. I think the link is badly blemished by that comment even though I am sure osmotic power is perfectly feasible and good and the research they have done is good. The link really could have done without that unfortunate and worse-than unnecessary comment and they really should have left that comment out; bad of them! Please don't mar good research with a corrupt report on it. I suspect the French apply somewhat different standards on these matters and am willing to chalk it up to cultural differences. Remember also that it's a press release, not a scientific paper. In these types of systems, the current increases with a thinner membrane. I envisioned a multi-layered system with free flowing free water next to the salt water. The salt gets depleted out of the salt water, so actually in a system like this both the fresh and salt water would be free flowing, but your idea still holds. We need a process engineer. There're probably a couple of tricks we haven't thought of here. The potential of the new system is huge. According to their calculations, a 1m² membrane with 30% of its surface covered by nanopores should be able to produce 1MW of electricity - or enough to power 50,000 standard energy-saving light bulbs. That's not a practical proposition anyways, because a 1 sq-m membrane cannot withstand the sheer pressure generated by pulling 1 MW of power out. It will rip unless separated into tiny tiny pieces. Power is force over distance per second, and the force generated by the flow rate of liquid through such a membrane at 1 million watts per square meter would be enormous - 1 watt is the power to raise an 1 kg mass a meter in the air over 10 seconds - certainly way too much to hold with a membrane just atoms thick. @Eikka didn't read the thread. It doesn't have to be a single one meter square membrane. Ten thousand centimeter square membranes will do just fine. Ten thousand centimeter square membranes will do just fine. And yet the osmotic pressure won't change by making the squares smaller. A megawatt per square meter is still 100 Watts per square cm, and that's either a lot of water to push through the very thin membrane, or a very high pressure. The system is generating power from the flow of water much like a water turbine would, only directly. Water comes in and goes out the other end, and the drop in pressure across the device times the flow rate determines power. 100 Watts at a flow speed of 1 m/s means 100 Newtons of force which is equivalent to a 10 kg (22 lbs) weight pressing on the atoms-thick membrane. You need to split it smaller and smaller still until the membrane can plausibly hold against the pressure, but then your device has several orders of magnitude more support structure than actual membrane, and the whole 1 MW per square meter turns out to be just wishful thinking. The whole 1 MW/sq-m thing is basically like saying a spoonful of granulated sugar has the surface area of a football field. Well, try to actually cover a football field with a spoonful of sugar and you get the point. Nothing works where Eikka lives. I see this being used in the tail end of RO units which have very high concentrations of saline as waste. 1MW is an awful lot of ions moving. It is not clear how such a small surface could support current that high and further how are the electrons being stripped from the material in this process? I don't think this process works that way at all. You're not pushing water through it. Salt ions are being pulled thru the nanopores due to a charge differential, nothing else. You just need enough flow along either side of the membrane to keep the salt and freshwater charge differential high enough to keep the ions being pulled thru. Not really a matter of physical pressure. The MW figure was an extrapolative calculation based on rate of flow through a single nanopore. Doubt it will scale up that well, though.